Though it might seem like a commission from another century, the hunt to locate and collect rare plants from around the globe so they can be grown for scientific study and long-term observation is very much alive, and carries new urgency. One in five plant species on Earth is endangered. Changing patterns of temperature and rainfall, competition from invasive species, and loss of habitat are spurring new exploration—particularly in biologically rich areas. 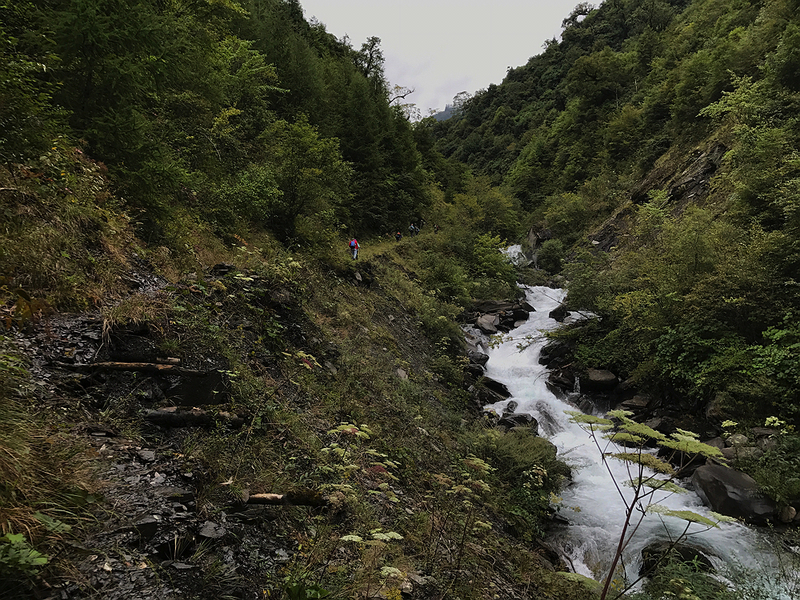 So it was that a two-week expedition there last September brought plant hunters—botanists in the North America-China Plant Exploration Consortium (NACPEC), including representatives of the arboretum—back to beautiful, challenging terrain. The group is part of a larger effort focused on collecting wild specimens from across their full geographic range, at altitudes high and low; the goal is to capture the variation, and underlying genetic diversity, within species. Differences between one isolated population and the next range from the observable or aesthetic—the color of the bark, leaves, or flowers that might catch a gardener’s eye—to the functionally important: cold hardiness, heat and drought tolerance, or disease and pest resistance. The team on this particular trip—Michael Dosmann, the arboretum’s keeper of the living collections, and Andrew Gapinski, manager of horticulture there; Wang Kang, director of education at the Beijing Botanical Garden, and Quan Jian, assistant to Beijing’s manager of living collections; and graduate student Li Huaicheng from Chengdu’s Institute of Biology—gathered in Chengdu, the capital of Sichuan, on September 19: late enough in the season for fruit and seeds to have set, but before leaf- and snowfall. The next day, after picking up supplies at the institute—portable plant presses, seed-collection bags, and a telescoping, 12-foot pole pruner that clips and then holds specimens—they drove north, stopping once for gas at the last known filling station on their route, where the fuel had to be siphoned from oil drums. 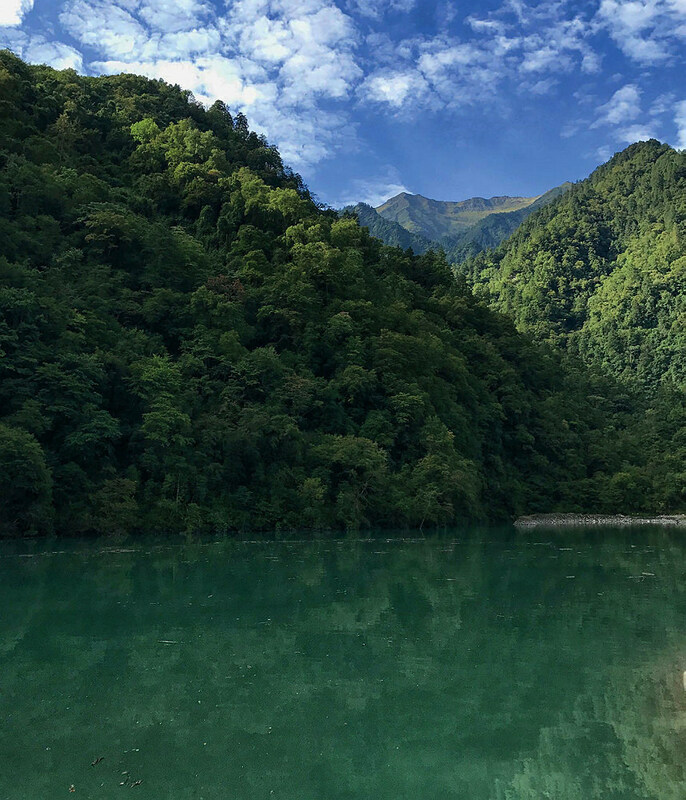 Their destination was a 245-square-mile national nature reserve in the heart of the Min range, named after its highest mountain, 18,334-foot Xuebaoding (Snowy Treasure Peak). In other words, the expedition team (with an observer from this magazine) was about to enter the heart of hardy plant biodiversity. The contemporary collectors had certain advantages over Wilson—airplanes, motorized vehicles, and GPS mapping—instead of reliance solely on foot, pack animals, and a 25-person entourage of hired laborers. But once in the botanically rich, undeveloped parts of China, twenty-first-century plant collecting is still rough work. And so they shouldered their packs, grabbed their equipment, and followed their guide, clearing the way with his reaphook, across the dam and into a bamboo thicket. From the river’s edge, the terrain rose sharply, requiring hand-over-hand climbing. After 25 minutes of thigh-burning ascent, they reached the top of a ridge, elevation 6,900 feet—where they discovered that they’d taken this route because the guide believed they wanted to see a giant panda. Dosmann holding a voucher specimen of Betula insignis. The fat upright catkins are this birch’s female parts, while the dangling catkins, the longest of any birch species, are male. Rodgersia, with large, horse-chestnut-like leaves, functions like a ground cover. The misunderstanding was amusing, but also fortuitous, because it led to several desirable plant collections. Atop the ridge, the fruits of a lanky crabapple tree, reaching for light in a forest of bamboo (a staple in pandas’ diet), immediately registered with Dosmann, who recognized Malus hupehensis, the tea crabapple. More than a century earlier, Wilson, the first keeper of the arboretum (Dosmann is just the second to hold the title), had discovered this tree in Hubei Province; he considered it the finest deciduous flowering tree he had introduced to Western cultivation. In spring, deep pink buds fade to white as the floral display crescendos; in fall, ornamental yellow fruits tinged with red produce a second show, evident even in the latticework shade cast by the bamboo canopy. As the group deposited the tiny crabapples in a muslin collection bag, monkeys began calling. “Apparently, they like this species of Malus,” Dosmann wrote in his field notes, “and may not be happy that we are collecting it.” For each acquisition, he recorded place name, GPS coordinates, elevation, habitat, slope, soil type, measurements, and a description of the plant (including bark, leaves, any fruit or flowers), and other species growing nearby. While Dosmann logged these observations, Gapinski prepared five voucher specimens, or representative samples. After carefully selecting characteristic terminal branches that included stems, leaves, and fruit, he laid them on a sheet of newsprint labeled with the scientific name and the collection number, beginning with 001. Then he covered them with another sheet, and sandwiched the whole between two pieces of cardboard. These he stacked and loaded into a portable press resembling a bicycle courier’s pouch, cinched tight with straps, which he threw over his shoulder—the first step in a journey to herbaria at Harvard, the National Arboretum in Washington, D.C., the Beijing Botanical Garden, the Chengdu Institute, and a regional herbarium in Pingwu. Since 1991, a dozen Chinese and North American member institutions of NACPEC have shared the costs and the rewards of these roughly biennial expeditions to China. The aims include conservation, evaluating and introducing appropriate new species, selecting ornamental forms, broad sampling of the wild genetic pool of species already in cultivation, improved understanding of botanical diversity in China—and better national and international collaboration among botanists. Wang, an exemplar of this latter aim, has brought deep knowledge of China’s flora, as well as logistical expertise, to seven such trips. For example, when an August earthquake upended the original 2017 itinerary, which circled the Min mountains, he arranged a new route at the last minute: right to the middle of the botanically rich range, for four days of collecting. Wang also did all the driving. Blind corners on the road, mudslides, and washouts alike left him unfazed. Although the arboretum has participated in plant-hunting expeditions since the 1870s, including those to China, it has recently stepped up the pace, intensity, and breadth of its collecting, as part of a 10-year effort targeting 400-plus species from around the globe (see “The Plant Prospectors,” July-August 2016, page 37). Recent expeditions have ranged from Idaho to coastal North and South Carolina, and from China to the Republic of Georgia. A visit to Japan is planned next year. In the past, Dosmann might have been the sole representative collecting on the arboretum’s behalf—he has been to China eight times—but the scale of these broadened efforts has involved other botanists on the staff. Gapinski, for example, explored the Republic of Georgia in 2016. 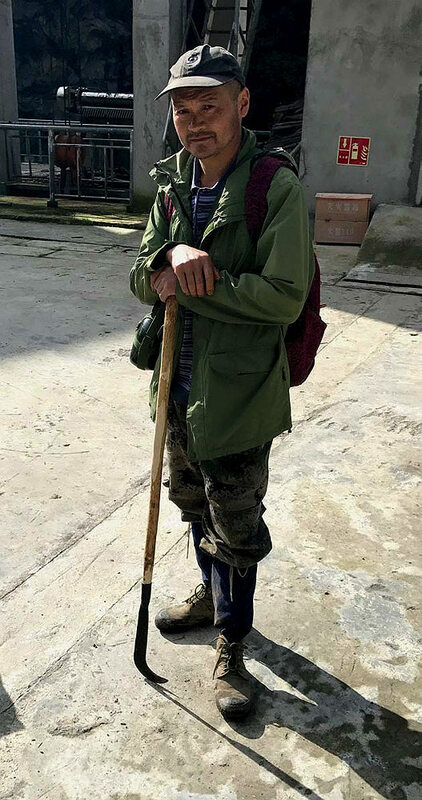 And although he had been to China just once, he is familiar with many of its plants as manager of the horticulturists who care for the arboretum’s trees and shrubs, a quarter of which hail from that country. As the group hiked upslope deeper into the forest, Dosmann noted species characteristic of this region: a smallish magnolia, whose leaves when crushed smell like anise (Magnolia liliiflora); the common birch-leaved viburnum (Viburnum betulifolium, a species so highly variable that Wang made it the focus of his Ph.D. dissertation); and a towering, thick-trunked specimen of Betula albosinensis, a birch that doesn’t like the extremes of the North American climate, he said. Amid such abundant botanical riches, knowing what not to collect proved a critical skill. Moving into progressively older, more densely shaded forest, the explorers found that the trees had grown so tall, they frustrated sampling, and even Gapinski’s height—he is six-foot-five—combined with the 12-foot telescoping pruner could not help. From the ground, they stared longingly toward the remote canopy or in wonder at thick trunks of birch and larch so tall that it was hard to connect them to their crowns, making it hard to identify the species. Even a climbing hydrangea they hoped to bring home had grown so high that it had set no seed within reach. While they walked, Li Huaicheng, who had come to gain experience in fieldwork, shared some dried yak meat to stave off pre-lunch hunger. Eventually, they entered a light-filled glade beneath an opening in the dense canopy, where they saw a large, open-crowned tree with what looked like foot-and-a-half long streamers cascading from high branches: a towering, large-winged wingnut (Pterocarya macroptera), a relative of hickory. The streamers were actually strings of connected, winged seeds. Dosmann, who has curated the arboretum’s living collections since 2007, was eager to acquire this tree because the specimen growing in Boston, collected in 1997 from Emei Shan, a mountain to the south, is not reliably hardy. But repeated, powerful throws by Gapinski, attempting to rope a limb, fell just short. Unwilling to admit defeat, one of the party wrapped his arms and knees around the moss-covered, branchless trunk and began inching his way up. Seeing this apparent act of desperation, the guide intervened, indicating that there was another specimen uphill with lower branches where they could collect seed without difficulty. Along the way, they passed an enormous larch, the ground beneath it strewn with cone-bearing limbs (thrown down by monkeys, according to the guide). Dosmann decided to collect specimens and seed: this was the Sichuan larch (Larix mastersiana), a tree discovered by Wilson in 1908. The species once grew in large stands, but was harvested for its wood and is now endangered in the wild and rare in cultivation. After collecting from the smaller Pterocarya, the party headed back to the river, descending through a plantation of Magnolia officinalis, a plant Wilson introduced to the West that is cultivated for its medicinal bark. They arrived at the dam just in time to see a poisonous snake being rescued from a sluiceway by a workman: scooped into a galvanized wire basket and released below. As the light began to fail, Wang swiftly drove the group back down the narrow road to their base, a forest-ranger station in the tiny village of Si’er. He did not want to drive these mountain roads, easily blocked by rockslides, in the dark. 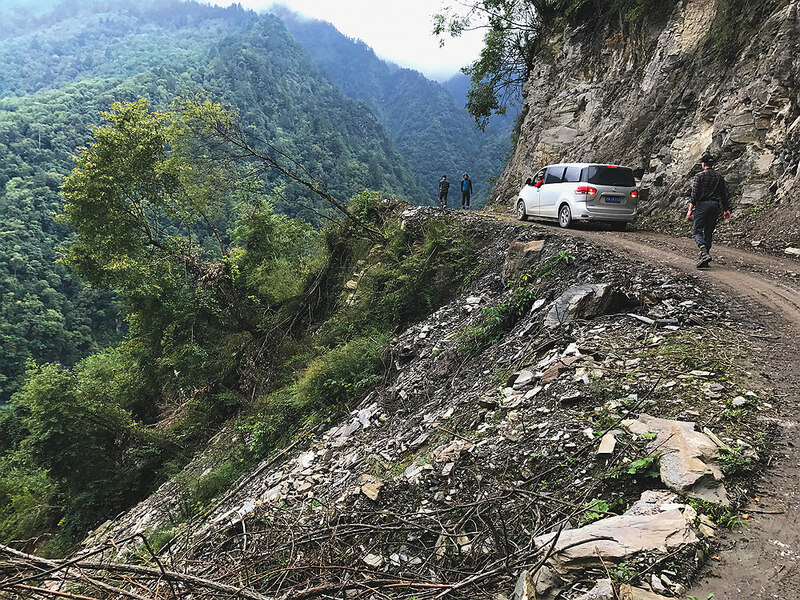 (While driving up to Si’er from Mianyang, the nearest large city, on the previous day, the group had counted more than two dozen slides, some still being cleaned up.) What happened to E.H. Wilson—whose career as a botanical explorer had nearly ended with a rock slide that broke one of his legs as he hunted the Regal Lily (Lilium regale, which he called “a jewel beyond price”)—began to seem less like a freak accident and more like an occupational hazard. (For more about Wilson, see “Lilies for ‘Chinese’ Wilson,”  March-April 1986, page 50.) Monsoon-like fall rains that coincide with the time that plants set seed, peppered with the occasional earthquake, can set mountainsides in motion. So it was no surprise when Dosmann had to leap from the van on the descent to roll a large rock out of the road. After dinner seasoned with the region’s distinctive Sichuan pepper (a species of Zanthoxylum), the group gathered in the office of station head Zhe Yue. Dosmann, armed with a magnifying loupe, began “keying out” species, making positive identifications of plants he had not been able to definitively classify in the field, such as the larch and the maple. Finally, at 11:00 p.m., the day’s tasks were done. The next three days of collecting differed markedly from the first: there would be no more bushwhacking. In the fading light of that first day, the group had in two hours collected as many plants by the road as they had during the prior seven in the forest. As Dosmann explained, collecting from the slopes above and below paths, roads, and rivers can often be more productive than exploring a forest. Plants on the edges of open spaces have less competition, get more light, and are therefore more likely to set seed. They are also easier to spot and, absent competition for light, they tend to branch lower, putting their seed within reach. Each day, the group would use flagging tape to mark species they wanted to collect during their ascent, then gather specimens as they retraced their steps on the way back down. This would cut down on the weight they carried, and also lead to better decisions about what to collect. With this strategy, the pace of collecting would increase dramatically. And on their second day doing this, they would find a treasure—a tree that hadn’t been collected in more than a hundred years. The expedition resumed the next morning, when the collecting party met their guide at 7,000 feet beside a river in a valley east of the dam. 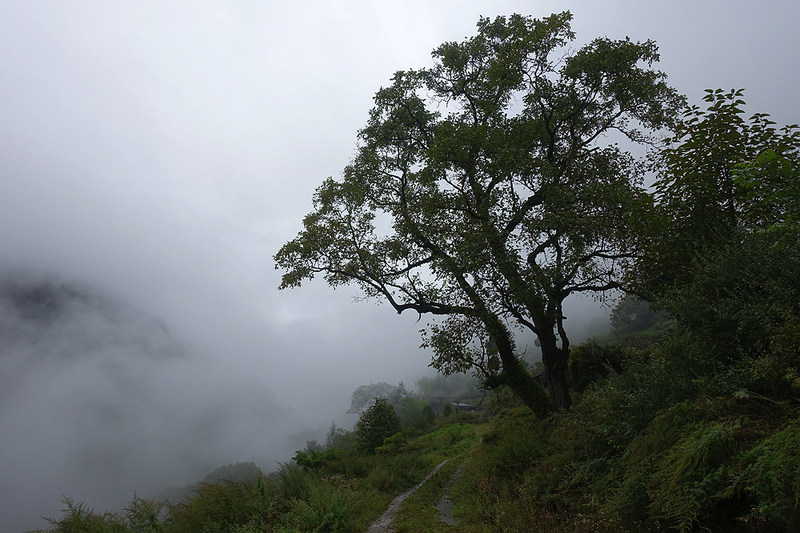 Though the site was not far from the previous day’s explorations, the plants were completely different—a vivid illustration of Wilson’s rapture about Sichuan’s unique diversity. Dosmann immediately spotted Cercidiphyllum japonicum, or katsura (as it is known in Japan), growing from the rock wall on the opposite bank. He knew this plant better than any other—he’d studied it extensively and written a thesis on it—but, remarkably, given his wide travels in Asia, had only been able to collect it from the wild once, in 1999. Despite the cool weather, flowers were still blooming, including yellow ligularia (a Wilson introduction to Western horticulture, circa 1900). Along a path beside the river, the group gathered a dogwood (Cornus bretschneideri), with its small blue-black fruits, then Hydrangea bretschneideri, its late-season blooms held on delicate panicles. Wang placed the whole hydrangea flower head in a bag, he explained, because hydrangea seed are so small and light that once dry, a single sneeze could blow them all away. They gathered moisture-loving herbaceous species, too: a six-foot Astilbe grandis; and Rodgersia, with large, horse-chestnut-like leaves that had spread almost like a ground cover between the path and the river. In the river’s floodplain, the group collected Engler oak (Quercus engleriana), with unusual, elongated, lanceolate leaves; seedpods from a 6-foot-tall flower called cardiocrinum—narrowly avoiding a poisonous caterpillar feeding nearby; and the toxic fruits of a handsome phoebe tree (Phoebe faberi). Dosmann was skeptical that the phoebe, a broad-leaved evergreen, could survive a New England winter. But it held bewitching, midnight blue fruits on bright vermillion stems, set off by rich, deep-green leaves. The tree might thrive at a NACPEC partner institution farther south. After forming a human chain to hold Wang as he leaned over a ravine armed with the telescoping pruner, they clipped nutlets from a Chinese linden (Tilia chinensis). Like the American and European varieties, seeds of this linden attach to leaves that spin when they fall, helicoptering to the ground, to the amusement—especially—of children. Not far from the phoebe, the group collected a small-leaved holly (Ilex bioritsensis), notable for its hypodermic-like barbs. But Dosmann turned down the prospect of collecting from a huge yew (Taxus), though the seeds were strewn abundantly on the ground. The plant is at risk because its berries have anti-cancer properties, and is therefore protected by the Convention on International Trade in Endangered Species of Wild Fauna and Flora. Dosmann’s ambivalence stemmed in part from the prospect of bureaucratic entanglements when shipping seed home. Back in Si’er that evening, the glowing coil of an electric hot plate took the chill out of the night air in the station head’s office, as the botanists removed seeds from collecting bags and placed them in disposable paper bowls to dry. Into the evening, Dosmann focused intently on his field notes, working out species identifications for the day’s collections before finally heading to bed. For the arboretum, one of the great troubles in attempting to diversify the wild origins of its earliest Asian plant introductions—ensuring that they come from across the species’ geographic range—is that nobody has ever been able to accurately reconstruct Wilson’s travels through China. Even Wilson himself, who wrote about his journeys many years after the fact, may not have remembered exactly where he was when he collected each plant. Complicating the effort, many of the Chinese place names that Wilson did record—tiny villages, many of them—have since been changed, and forgotten. The best hard evidence for placing Wilson therefore comes from the photographs he took. Yin Kaipu, a professor emeritus at Chengdu’s Institute of Biology who has explored Sichuan extensively—on horseback—has spent years identifying the sites Wilson photographed. He had presented a copy of his book, Tracing One Hundred Years of Change, to one of the party. In it, Yin pinpoints the location of 300 of Wilson’s photographs, including one of a famous tree: a massive katsura that Wilson photographed in the Dupingba valley on August 17, 1910 (and perhaps the tree that he described in A Naturalist in Western China as being 55 feet in girth). The third day, though planned as a sort of pilgrimage to Dupingba, included some of the best collecting of the whole trip—and it was a different tree, not the katsura, that most captivated Dosmann and Gapinski. From Si’er, the party drove northeast, up several switchbacks and then along a river where a huge washout had taken two-thirds of the width of the dirt road. The metal guardrail that had formerly marked the road’s edge lay in the river below. As everyone held their breath, the van fishtailed through the muddy strip of remaining roadway, and then continued on, reaching a locked barricade. There they were met by a new guide, He Sixian, who knew this valley well. The legendary katsura was a brisk, two-hour walk away. Less than 10 minutes up the road, Dosmann spotted a seedling Cercidiphyllum. Then the group noted dove trees (Davidia involucrata) everywhere, heavy with seed, and marked several with blue flagging tape. Wilson considered this the most beautiful and interesting of all the temperate flora (the species produces white petal-like bracts that resemble handkerchiefs), and raised thousands of seedlings. But the tree that riveted Dosmann was a beech. “This would be the all-star of the collection,” he said. Unlike most beeches, this species (Fagus engleriana) has multiple stems. The Chinese describe its growth habit as “chicken feet,” because the stems form a cup like the foot of a chicken turned upside down. Pandas frequented that tree, their guide said, eating bamboo while lounging amid the trunks. But this specimen had no seed. “We would sacrifice someone for that beech,” declared Gapinski. Beeches are one of the arboretum’s core collections: other institutions in the United States rely on the Boston site to grow and maintain a comprehensive swathe of the genus, but the arboretum has just the one lineage. Writing about this tree, Wilson described it as having generally six to 12 trunks, slanting away from one another as they grow. He also noted that although he could find small plants, he could find no flowers, suggesting that the tree sets seed infrequently. But seedling collection is not an option for modern American plant hunters: since 1914, bringing soil into the United States has been forbidden. The 1910 photograph of the tree taken by Ernest Henry Wilson. Wang, Dosmann, and Gapinski recreate the historic photo. Photograph © President and Fellows of Harvard College. Arnold Arboretum Archives. Photograph at right by Jonathan Shaw. After passing another of these apparently seedless special beeches, the group moved briskly, crossing a river (where it had erased the road) by balancing on the trunks of young trees laid across the water. After climbing a muddy hillside, they reached a field with several mature katsura trees before wading through a thicket and at last reaching the ancient specimen. After taking photographs to match Wilson’s, and collecting seed (the pods resemble tiny string beans), the group ate lunch in a nearby field. Then they headed back. On the way down, they collected Enkianthus deflexus, a shrub with brilliant red fall color, and admired a spruce growing beside a river at the bottom of a ravine. Bathed in a constant mist, its limbs had been colonized by hartstongue fern, whose bright green leaves caught the afternoon light. They collected a beautiful birch, which Dosmann later identified as Betula insignis, rare in western gardens. Plants of this species now in cultivation, derived from a collection farther south in China, are marginally hardy in Boston. But this more northerly seed, collected at elevation, might grow well. “The short fat catkins are the female parts,” Dosmann pointed out, while the pendulous ones, the longest and showiest of any birch, are male. He was pleased to collect a specimen with fine examples of both. Finally, they reached the upper of the two Engler beeches. Although they had seen no seed previously, they scanned it with binoculars a final time. On a single limb, reaching for light, there were beechnuts. The seed was too high to reach, so they decided to use a pocket chainsaw attached to a throw bag to cut the limb. From his backpack, Gapinski produced a flat nylon square that, like a pop-up tent, sprang open to form a cube about 2 feet on a side, with an open top. Inside was a carefully laid coil of thin, strong rope, and a weighted leather sack. If he could throw the sack and attached line over the limb, they could connect the jointed saw chain to one end and run it up for the cut. But the chain lodged tight in the notoriously hard wood, and the collectors had to climb the tree with a handsaw. The rope proved useful in controlling the limb’s descent. After gathering seed of a mountain ash (Sorbus), they tried to reach a dove tree, but the most magnificent specimens all grew beyond the grasp of the telescoping pruner. At last they spotted a specimen on a steep slope above the road. After heroic efforts by Gapinski, Wang, and Li, involving rope, limbs pulled low under tension, and the pruner, they managed to secure a sizable collection of large fruits. That night, a heavy rain fell. In the morning, the river ran half blue, half brown with mud. Driving past the entrance to the valley they’d visited on the second day, they could see that the water in that tributary had turned brown, a sign that there had been a landslide. This would be their last day of collecting and they decided to explore the road above the reservoir, where they had turned around on the first day. Wang had learned that it led to a trail to Songpan, a small city about 18 miles to the northwest. Much of the landscape, shrouded in mist as they climbed, was under cultivation. The road curved up and up, until the reservoir was no longer visible below. Then, after rounding a bend, the road dead-ended at a traditional farm house. As they approached it, a dog appeared, barking, and a Tibetan woman followed. She and her husband, both 76, lived there. Her cellphone, her only way of communicating with the outside world, was not working. “Could we fix it?” While Wang spliced wires, the others looked around. Everywhere, plants were hanging to dry, and food simmered in pots in rooms throughout the house: pumpkins, rice, steamed bread, cabbage. Having repaired her cell-phone charger, Wang asked about the road to Songpan. “Ahhhh,” she said, and gestured everyone to follow her—into the house, through a carved doorway, and down a dark hall to another door, which opened to the backyard. She pointed. 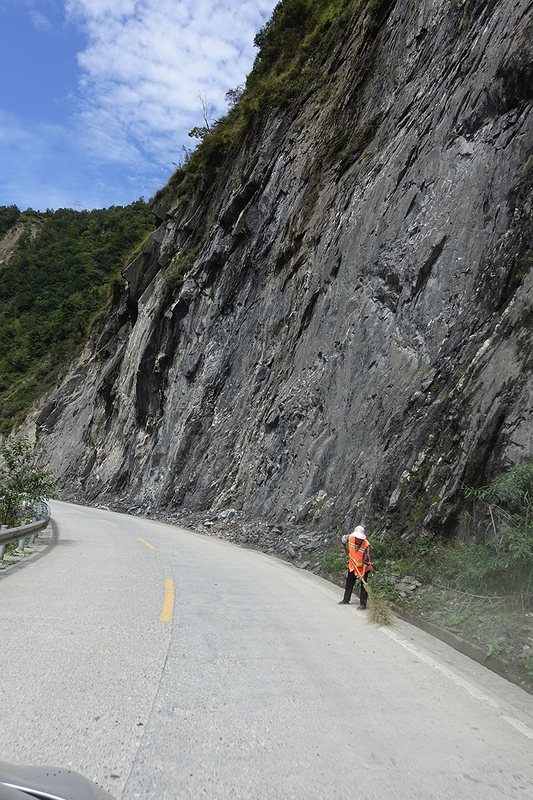 This was the road to Songpan—it passed through her house. The road beyond was in fact a narrow, overgrown path, and the group clipped their way slowly forward through heavy growth. But they did not make it far. After collecting five-flavor fruit (Schisandra chinensis), a vine with berries at once salty, sweet, sour, pungent, and bitter, and then Deutzia longifolia (a shrub with beautiful bicolor flowers, pink centered, rimmed with white), they had to stop. The scores of leeches were overwhelming, and the party retreated to the house to remove them. Boots and socks came swiftly off. Dosmann pulled five leeches from his feet and ankles. Gapinski, too, had been bitten. The road to Songpan appeared to dead-end at this Tibetan woman’s home. Wang learns that turning back was probably wise: there were lots of poisonous snakes on the road to Songpan, he was told—not just leeches. Spicy Sichuan peppers dry in flat baskets. The old woman disappeared and returned with cold wood ash from an open hearth. The ash, she told Wang, would kill them. Then it was time to return to Si’er and clean seeds. Several weeks and 7,500 miles later, at the arboretum, Dosmann and Gapinski celebrated. Their seed collection had made it through customs. They had divided the shipment into three parts, spreading the risk in case any of it failed to clear U.S. Department of Agriculture inspection. Dosmann carried some in his luggage to Boston, declaring it at the airport. Some went by post to inspectors in Jamaica, New York, and a third set to New Jersey. When inspectors find something they don’t like in a batch of seed, Dosmann explained, they might throw the whole lot in the incinerator. Or they might fumigate the seed, which can reduce its viability by half. When maggots are found after x-raying a single acorn, for example, one inspector may remove the infested corms, where another might reject the whole shipment. Worried about this possibility, Dosmann had, in fact, decided to abandon the group’s oak collections. He was taking no chances that the rest of the botanical treasures they had gathered might be jeopardized. By mid November, it was clear he’d made lots of good choices. Even as the first seedlings appeared in the Dana Greenhouses, the arboretum was fielding numerous requests for seed from other botanic gardens in North America, indicating strong interest, and ensuring wide distribution of the plants they’d brought home. In the end, that is the measure of a successful expedition. 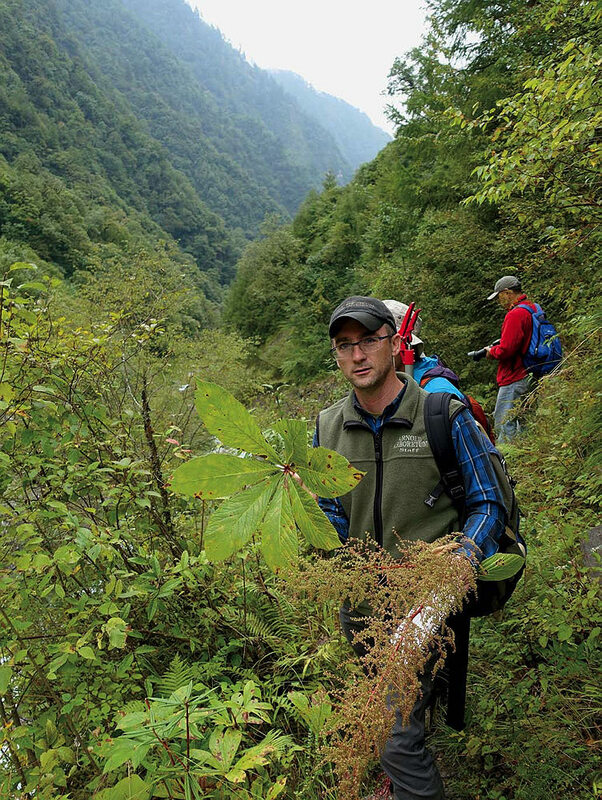 Managing editor Jonathan Shaw ’89 accompanied the collecting expedition during six days in Sichuan.